Your donkey will appreciate being brushed regularly at a young age. It is a way to be closer to your companion, and in taming it, but also to ensure him a good fur. In the adult donkey, an iron currycomb of iron will be more effective to clean its fur, particularly before the rambling or carting, and in spring when it loses its winter coat. Regularly, before and after any walk, think of cleaning the interior of the hoof with a metal hoof-pick. Even if the horn is very hard, the hoof of the donkey should not to be neglected. The horn of the donkey has the characteristic to be very hard, and to grow very quickly. The feet need reassessing by a farrier frequently. Any negligence can have serious consequences on the balances. In my breeding, the farrier visits to reassess the hoof at least three times per year. It is delicate work, so I do not advice you to do it yourself but call a professional. It is important not to forget the vermifugation approximately twice per year, more often for the foal (but follow your veterinary surgeon's advice) to destroy the internal parasites. For the small breeders, I advice vermifuges in oral syringe which contain a paste. These syringes are prepared in five or six hundred kilogrammes, therefore do not forget to adjust the ring with the weight corresponding to your donkey. 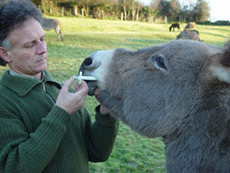 Lift the head of the donkey, introduce the nozzle of the syringe between the lips at the side of the jaw, take care to put the nozzle of the syringe is on the tongue, and push the piston until it stops by the ring. When the stallion is covering the mare, certain vermifuges can make it temporarily sterile. So, ask advice from your veterinary surgeon. This vaccine is necessary if your donkey participate's in public demonstrations (fairs, competitions, expositions...). Tetanus Tetanus is still very frequent in France, but it is not contagious, so it is not obligatory. Rage The rage disappeared in France, therefore a vaccination is not obligatory any more. It is better to use a vaccine influenza-tetanus to be sure. Two doses in 30 days apart, when it is 4 months old and if the mother has had regular inoculations. Recall equine influenza: six months later, then annual recall. Recall tetanus: one year later, then every three years. If you want validation of the inoculations on the identification card, it must be made by your veterinary surgeon who label's, dates and signs.